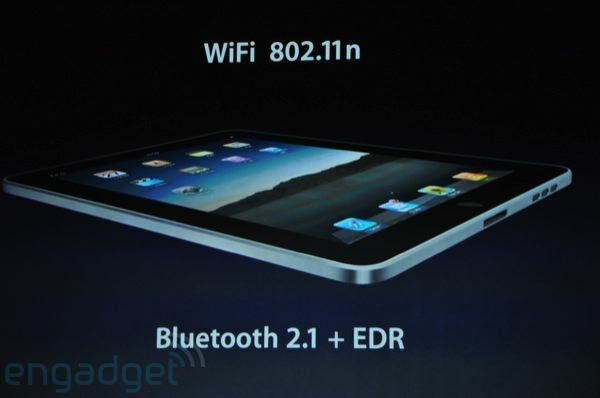 This entry was posted in Apple and tagged Hardware, iPad, Specification on January 28, 2010 by enddl22. 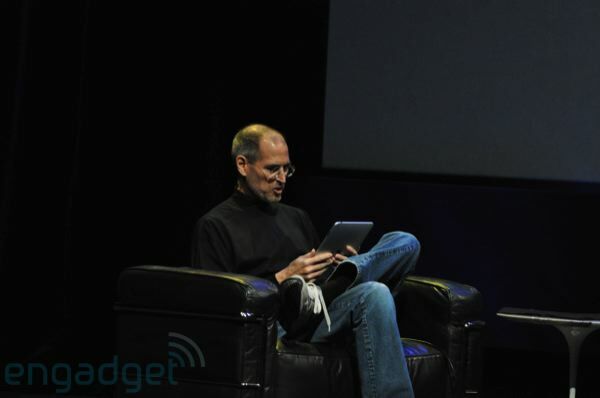 iPad from apple more and more..
11:33AM – “Apple’s the one place we can do this: we built battery tech, chip tech, software — we bring all those things together in a way no one else can do.” Video’s over, Steve’s back. 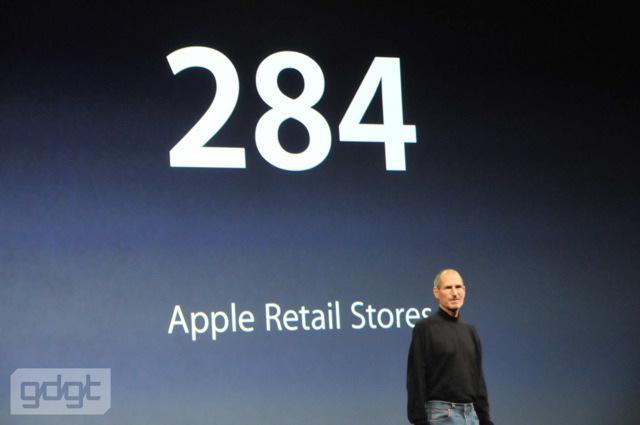 11:27AM – Will people buy it in droves? 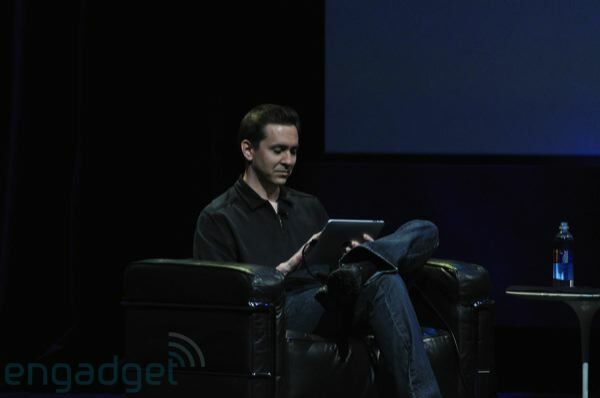 Is there actually room for a device between smartphones and laptops? That I don’t know — I’ve always been skeptical there’s room for a third category in there. 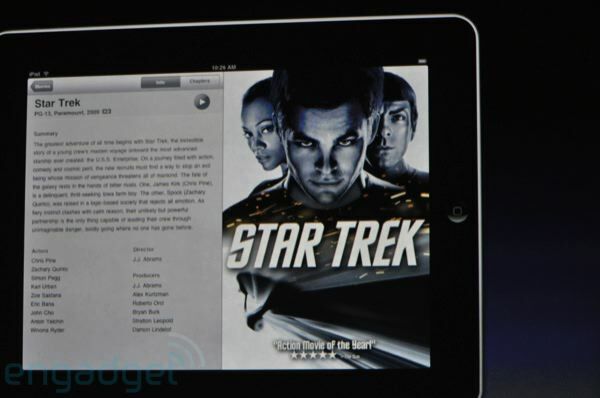 But if there is a contender for this space, the iPad is it. 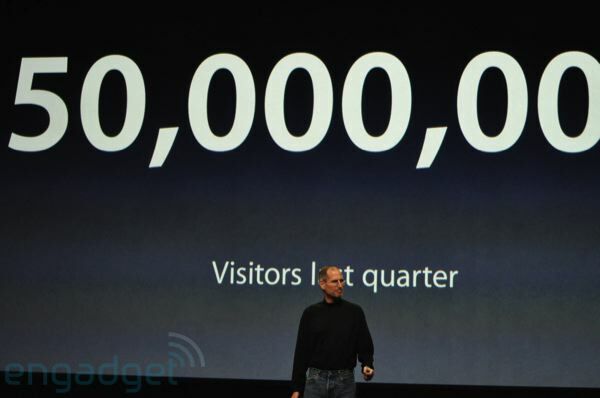 11:26AM – Yeah, you know, this video does a pretty good job of putting this stuff in perspective. 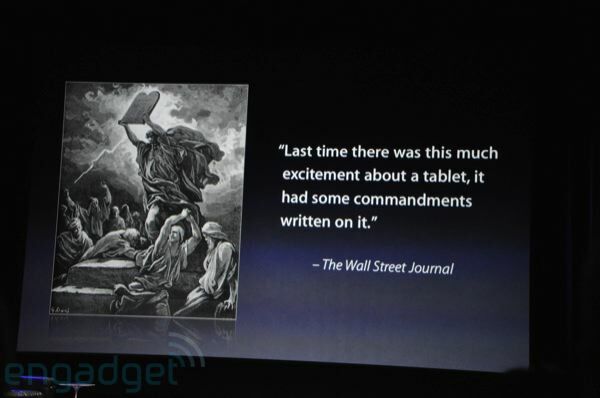 iPad is pretty amazing — there, I said it. 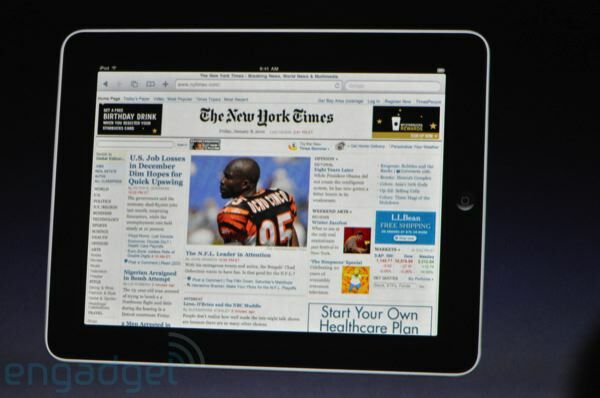 11:24AM – “It just feels right to hold the internet in your hand — when you see something, you just reach out and tap it. You don’t think about it… you just DO.” Yeap. 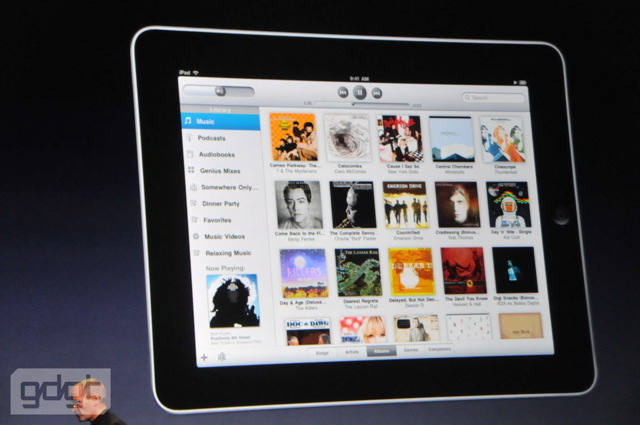 11:22AM – Showing a video! 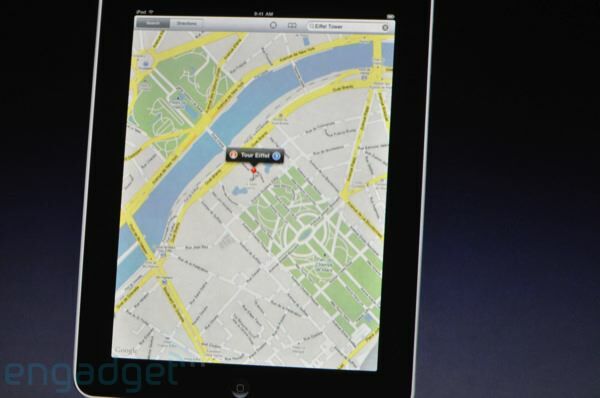 11:21AM – “We’ve got some great accessories as well — let me show you a few.” Dock! 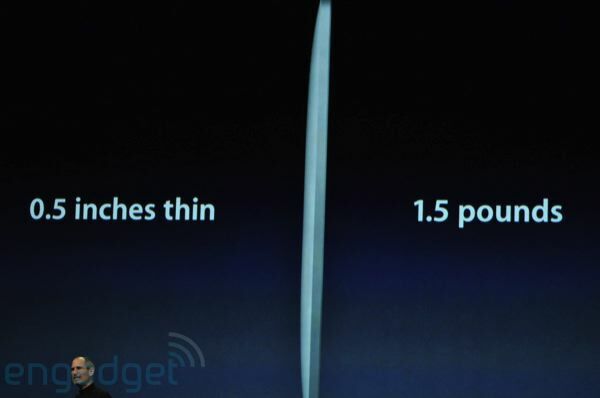 11:20AM – “Within about 90 days we’ll be shipping 3G models. 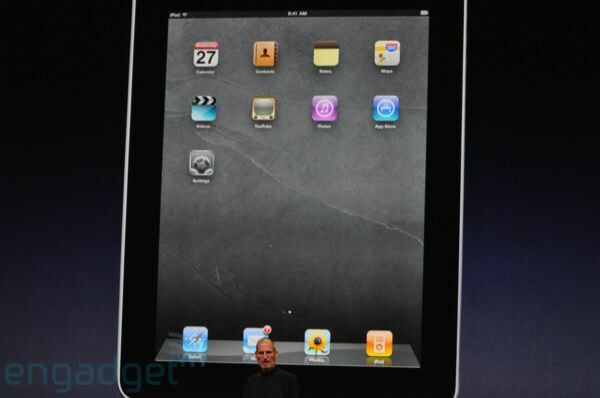 Soon you’ll be able to get an iPad in your hands for just $499.” Applause. 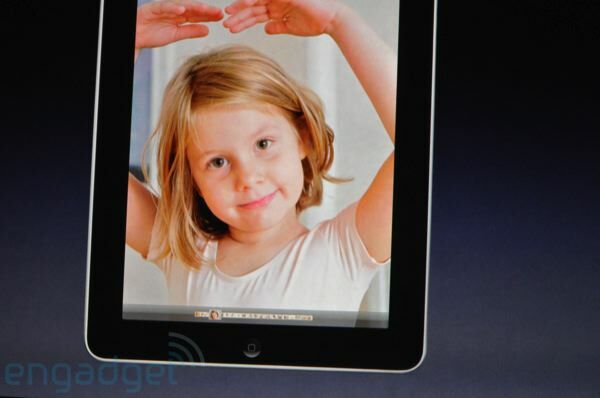 11:19AM – “I’m thrilled to announce to you that the iPad pricing starts not at $999, but at $499.” Huge applause. 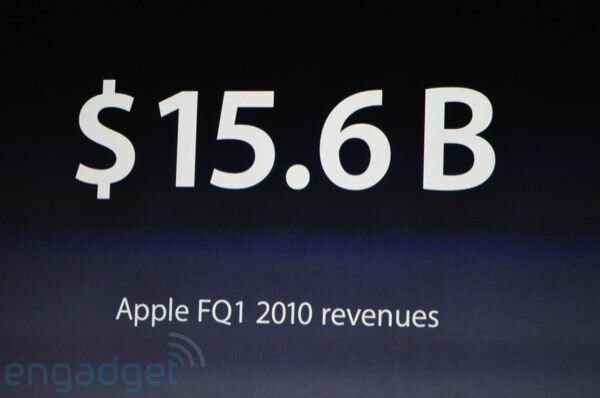 11:17AM – “What should we price it at?” Chuckles. 11:14AM – “If you feel you need more, we have an unlimited plan for just $29.99. 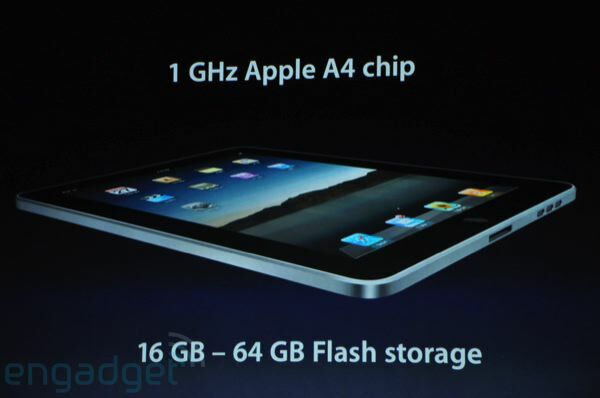 Real breakthrough prices. 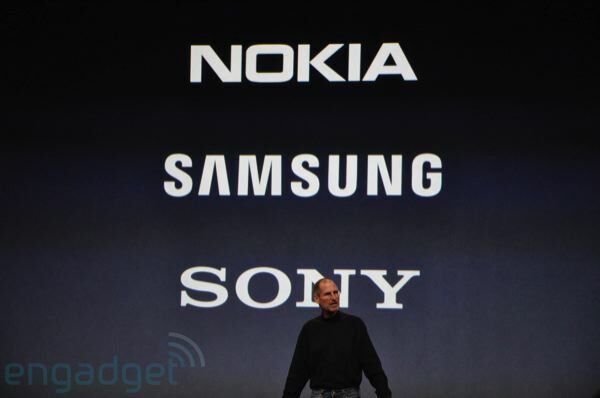 We’ve got a breakthrough deal with AT&T who is providing the service.” Ouch. 11:14AM – “We’ve got a real breakthrough here. Two awesome plans. The first is up to 250MB per month — a fair bit of data, most people will get by on that — for just $14.99.” Bit applause. 11:11AM – Showing forms, too. 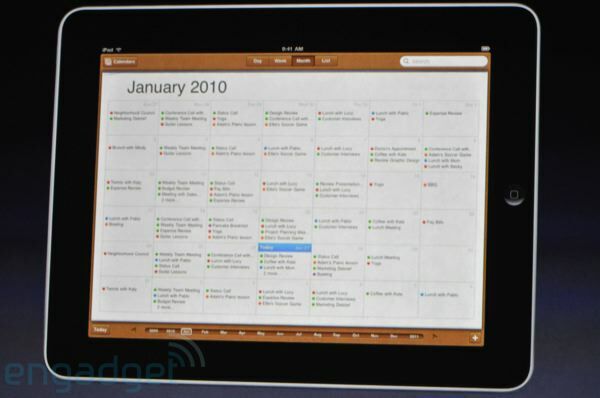 “That’s a quick look at iWork on the iPad.” Applause. 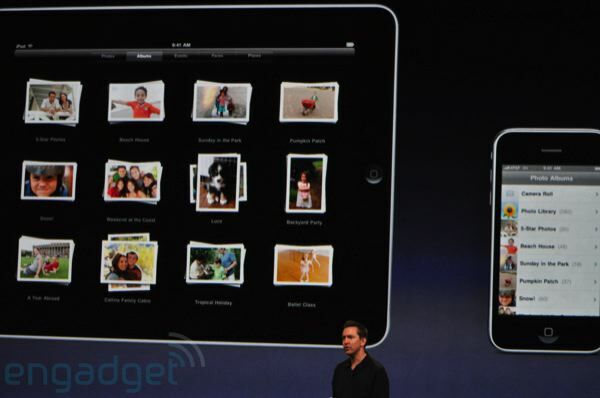 “They show the immense potential of the iPad. Apps like this are amazing, so what are we going to charge for this? 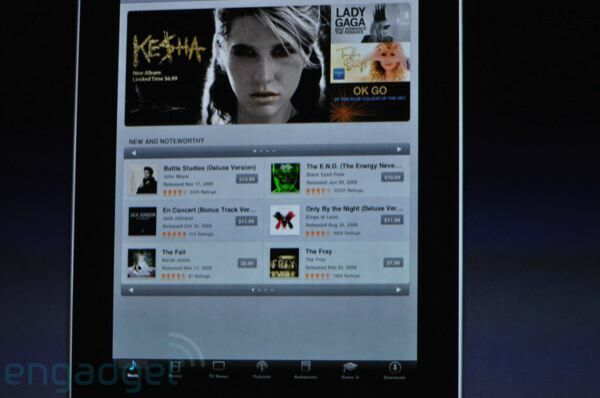 $9.99 each.” Applause. 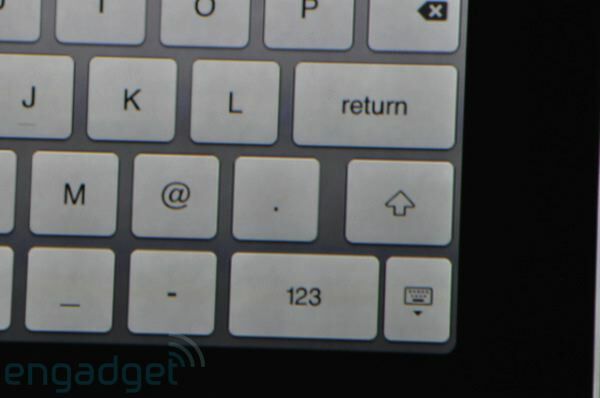 11:09AM – Showing the spreadsheet-centric soft keyboard. Auto-fields and sums showing as inferred. Pretty neat for a spreadsheet. Then again, it’s still a spreadsheet. 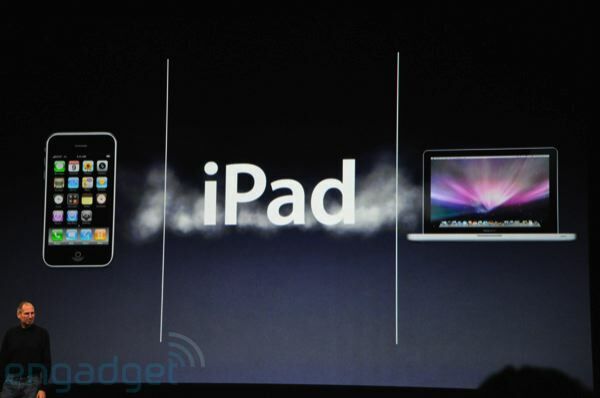 11:06AM – Now’s probably a good time to go add the iPad to your gdgt Want list, too. 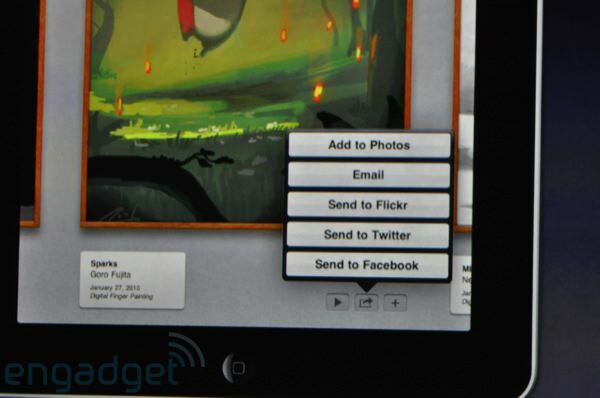 We also just turned on gadget voting at gdgt main, tell people what you think about this thing! 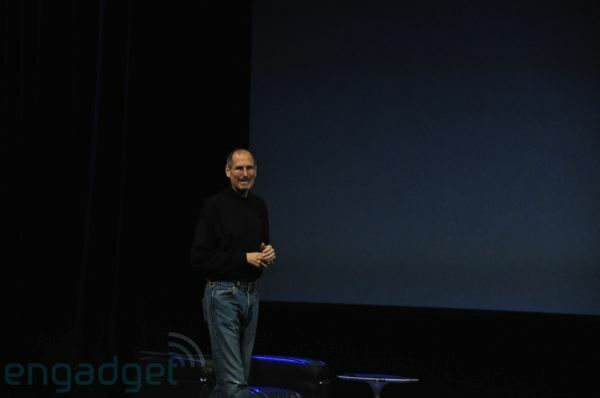 11:05AM – Phil’s done showing off Keynote, big applause. 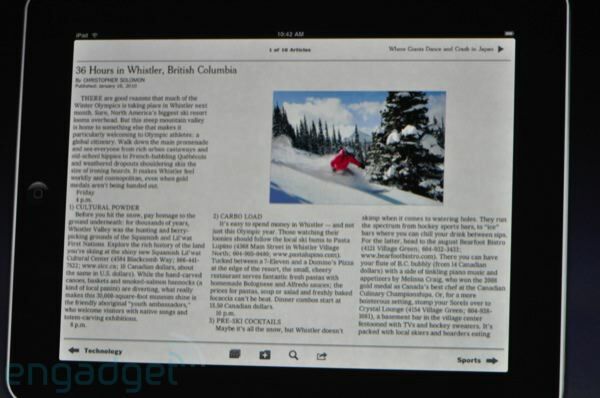 Showing Pages now! 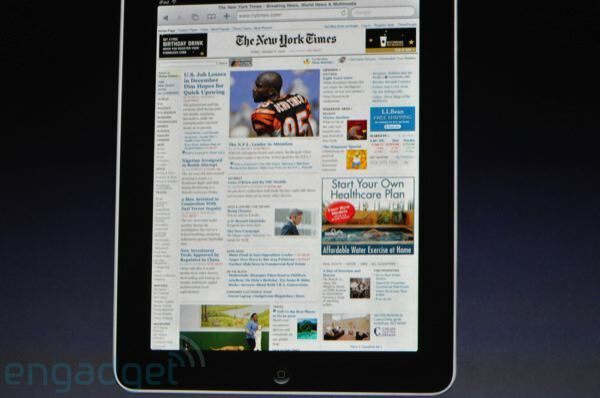 11:04AM – Don’t forget to go check out our iPad discussions! 11:02AM – Navigating slides — holding down slides rearranges it. 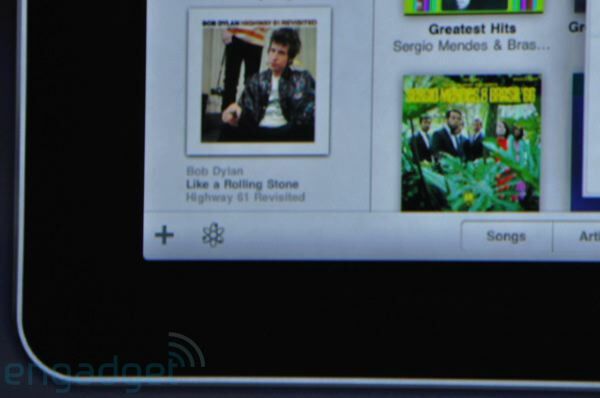 Tap multiple slides then do the move brings them as a bundle (neato!). 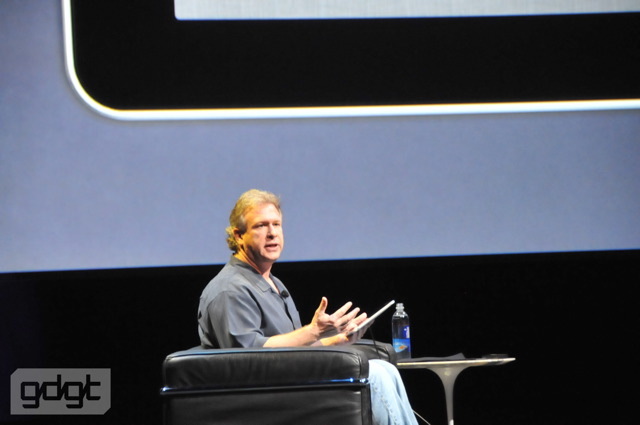 11:00AM – “The only way to appreciate how amazing this software is, is to show you, and I’m honored to be the first to show you iWork apps for the first time on the iPad.” First up: Keynote. 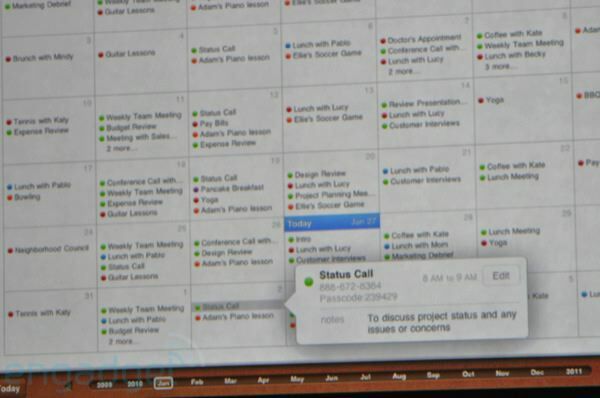 10:59AM – “I asked our team to take a look at iWork on the iPad.” Apparently Steve’s team wasn’t stoked at first, “but eventually the answer was youbetcha.” Rebuilt iWork UI! 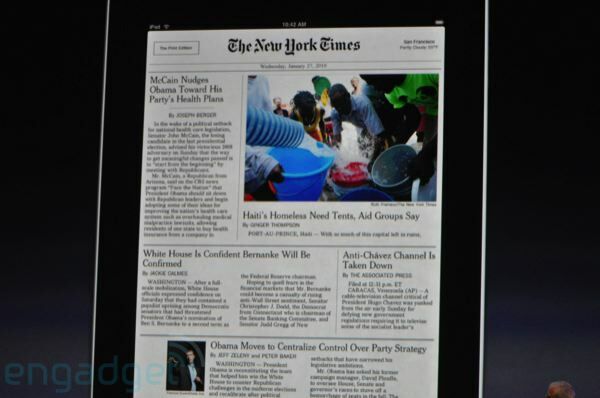 10:56AM – Tap right or left to change the page — or drag the page manually. Very nice! 10:54AM – “We’re very excited about this.” I think Steve said this is opening up this afternoon, but don’t quote me on that! 10:54AM – Somewhere Jeff Bezos just did a spit take. Well, probably not. 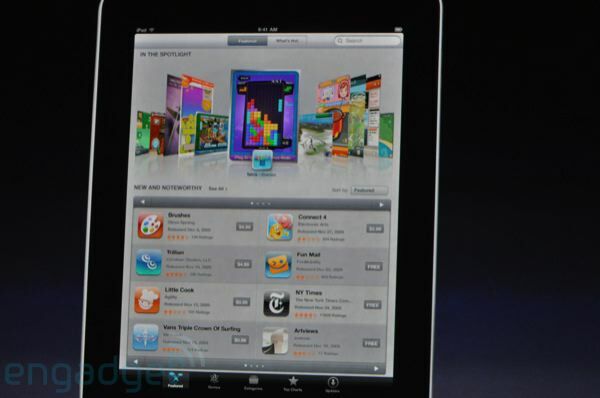 10:53AM – Our new app is called iBooks. 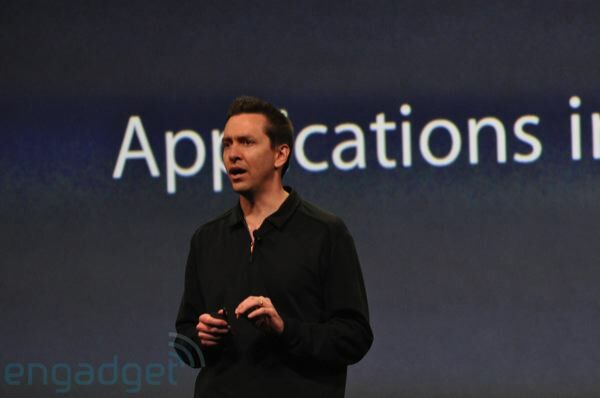 10:52AM – “We’re incredibly excited for the opportunity for developers to build amazing apps for the iPad. 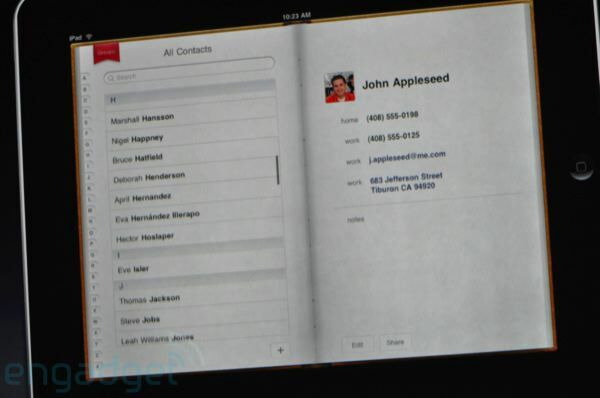 And as we wait for those apps to come out, we can run all our existing apps on the iPad. 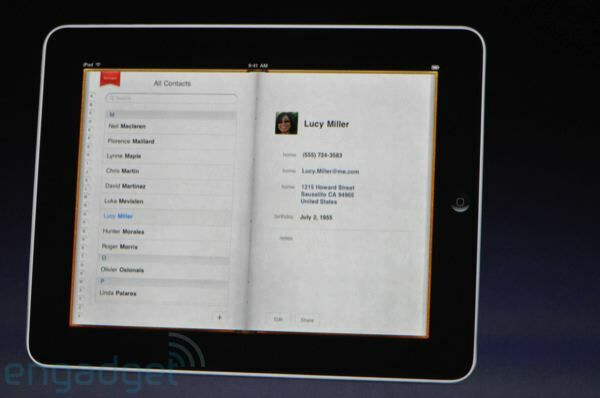 And that’s the app story!” Steve’s back. 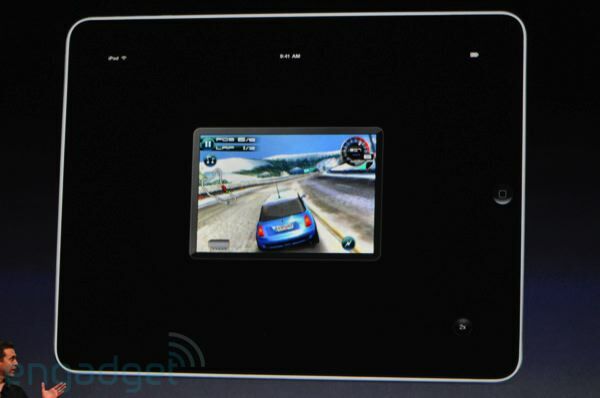 10:52AM – Game video with overlays, this is pretty dope. If you’re a baseball fan, seems like this is probably going to be your new preferred viewing experience. Scott’s back. 10:50AM – Scott: last up is MLB.com! Pretty intense, computer modeling of real games and inline video. 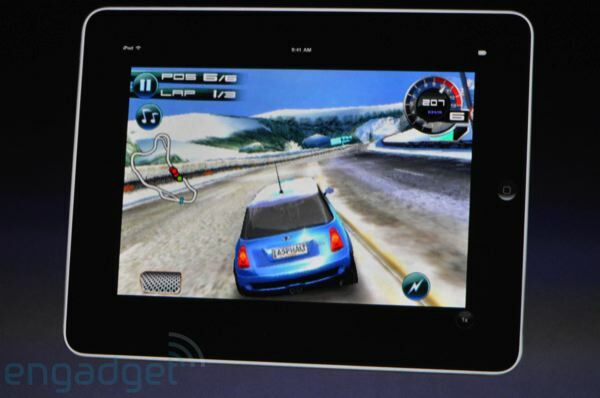 10:47AM – Showing Need For Speed Shift. 10:46AM – Scott: “Imagine artists can carry this wherever they go, including art students. And it’s only a pound and a half.” EA is up next! 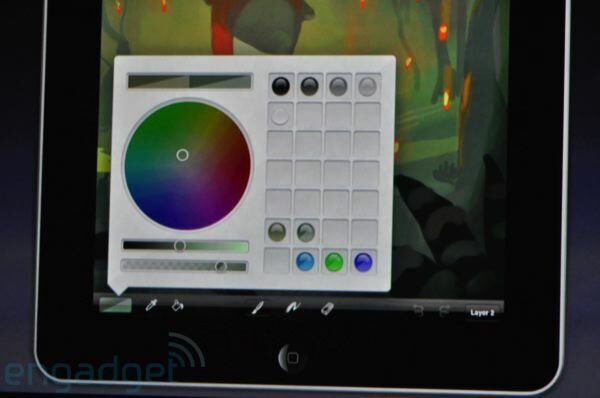 10:44AM – Next up: an app called Brushes, an art browser and painting app. 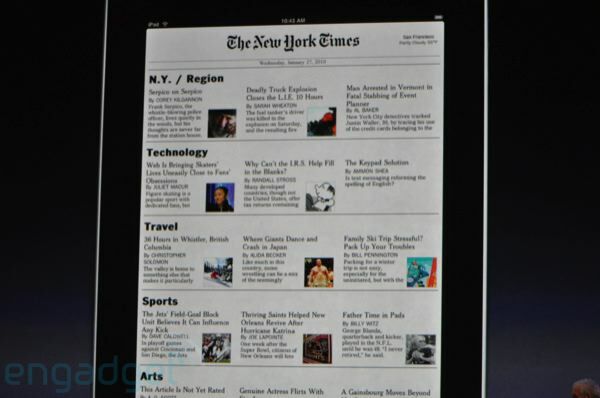 10:42AM – “It captures the essence of a newspaper, but it’s so much more.” Reading syncs to the iPhone app. 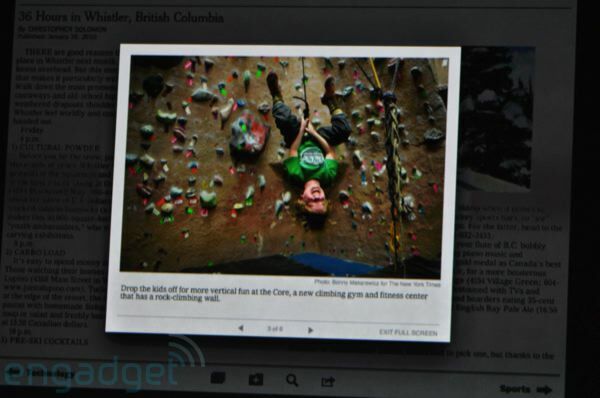 Inline video clips. So awesome. 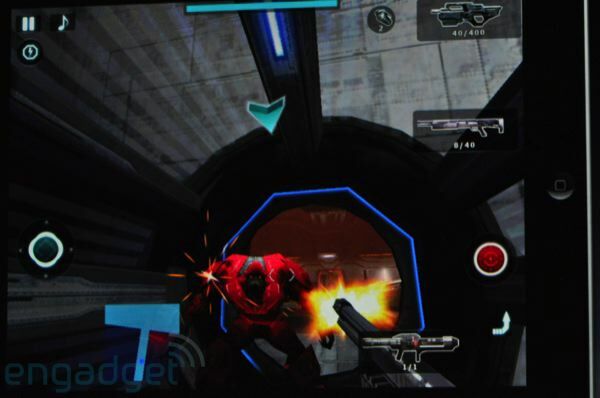 10:39AM – Showing first-person shooting with multi-touch, like target acquisition by drawing a graph in your HUD. Pretty neat! 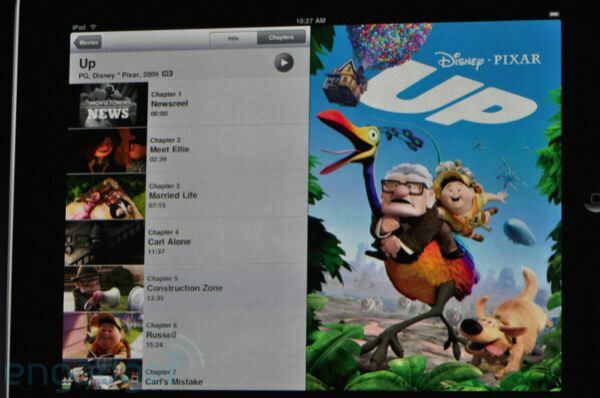 10:38AM – Showing a title called Nova. This looks pretty decent, but still a tiny bit choppy. But hey, this was done in two weeks, so I’m gonna cut these guys some slack. 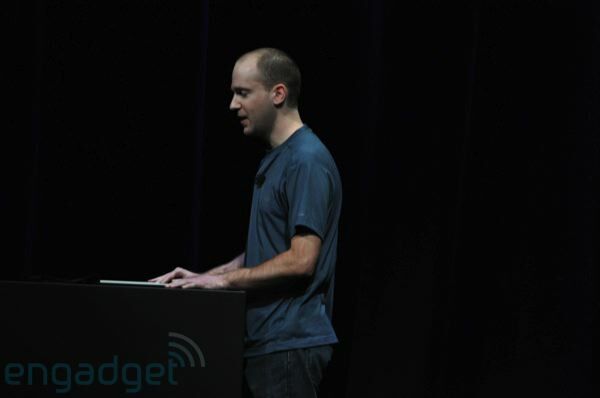 10:37AM – “We’re really excited about the possibilities for developers on the iPad. 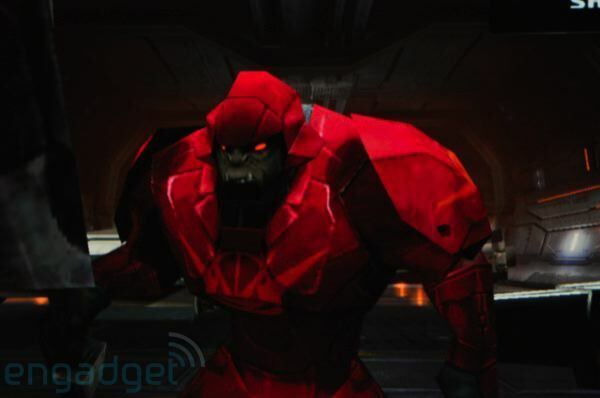 About 2 weeks ago we invited some developers to Apple to give them a sneak peek and see what they can build in just a couple weeks.” Starting with the “largest” game developer on the App Store: Gameloft. 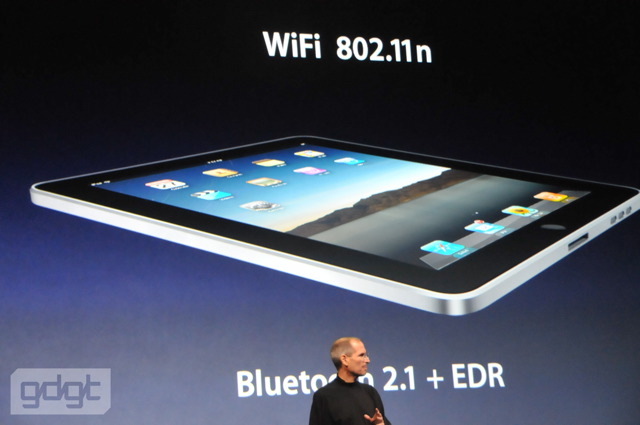 10:35AM – “If the developer takes the time, they can also take full advantage of the large touchscreen display in the iPad. 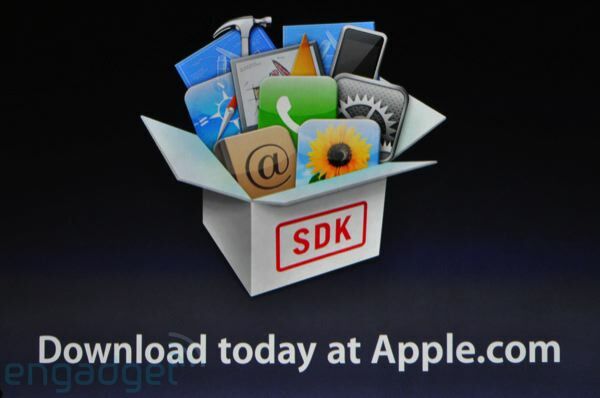 We did that with our own internal apps, and we expect developers will want to do that too.” New SDK out today including iPad tools. 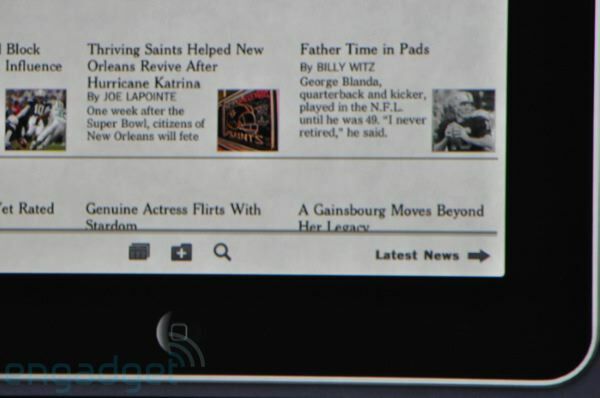 10:32AM – Showing Facebook app: “This is the app you know and love.” Tap on the 2x button, it scales the app up to full-screen. 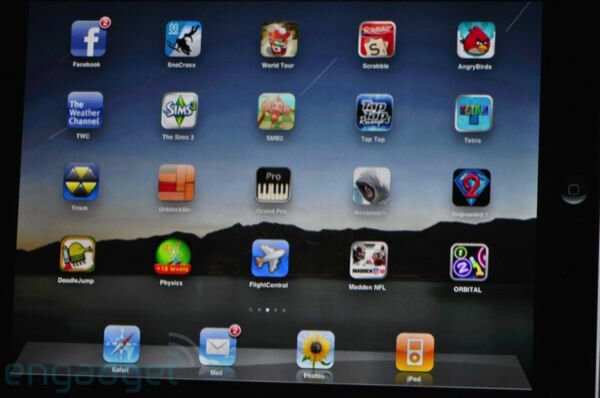 10:32AM – “We built the iPad to run virtually every one of these apps unmodified right out of the box. We can do that in two ways — do it with pixel for pixel accuracy in a black box, or we can pixel-double and run them in full-screen. This is really cool.” Demo! 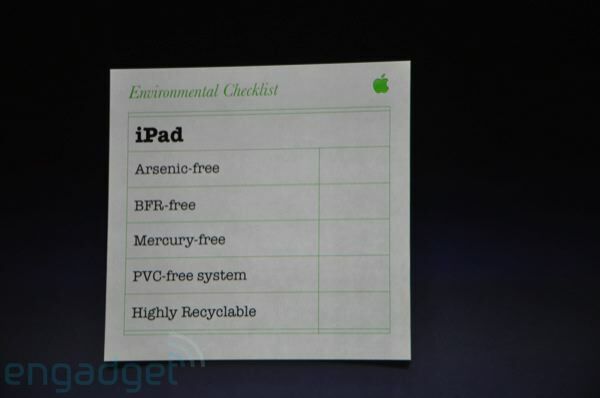 10:31AM – “Environmentally, the iPad is a good citizen. 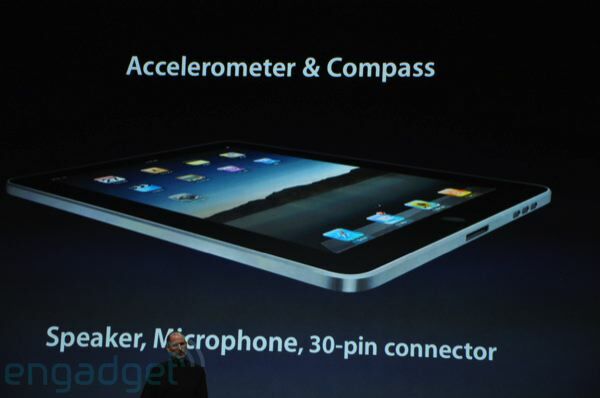 That’s a little bit of an overview of the iPad’s hardware. 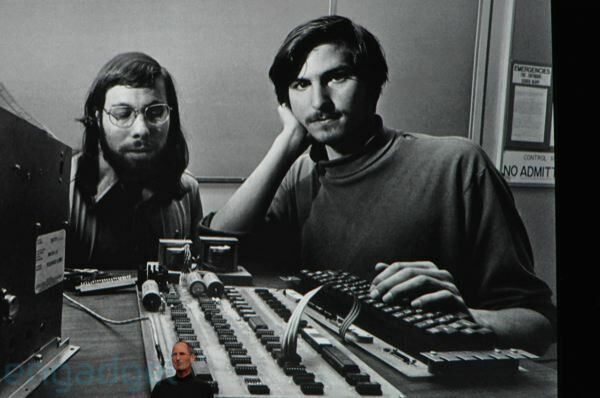 Let’s go back to software. We’ve seen great built-in apps. But let’s talk about 3rd party apps. 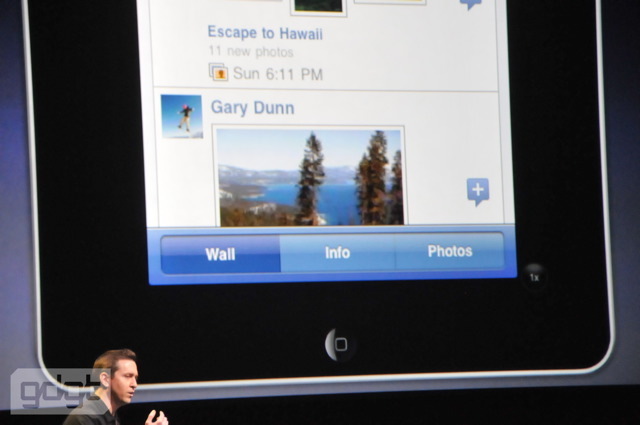 To help me do that: Scott Forstall, SVP of iPhone software.” Scott’s up! 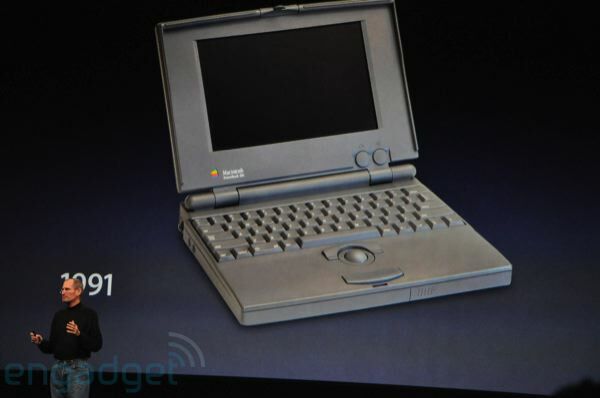 10:30AM – “What’s the battery life on this remarkable device?” Pauses. 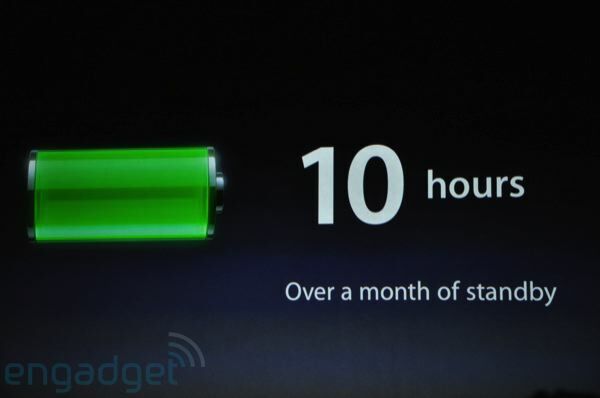 “We’ve been able to achieve 10 hours of battery life.” Big applause. 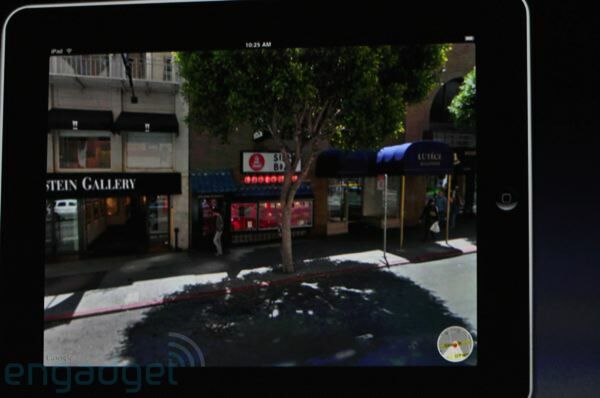 10:25AM – Street view support looks pretty amazing. 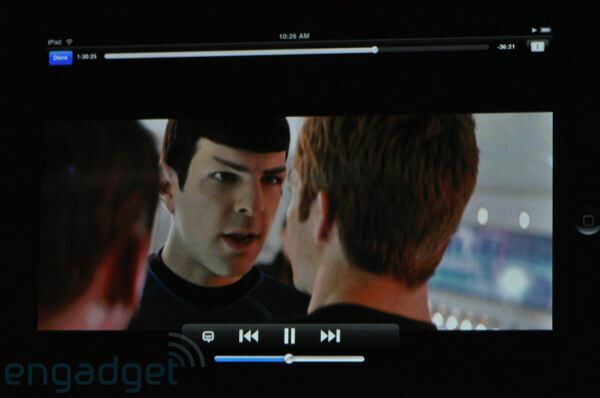 “Let me show you video, it looks wonderful.” Showing HD YouTube playback. 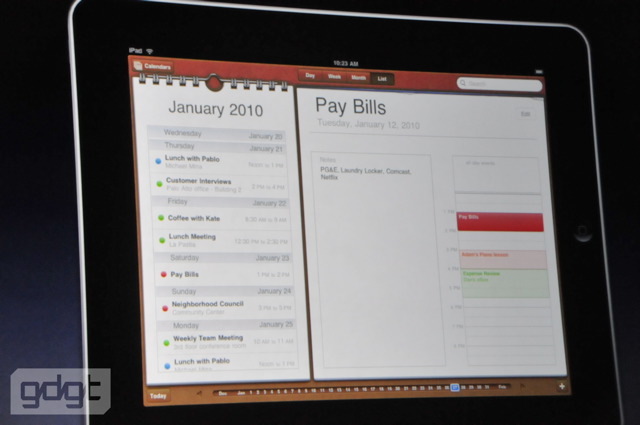 10:24AM – Showing calendar and maps, both look pretty amazing on this display. 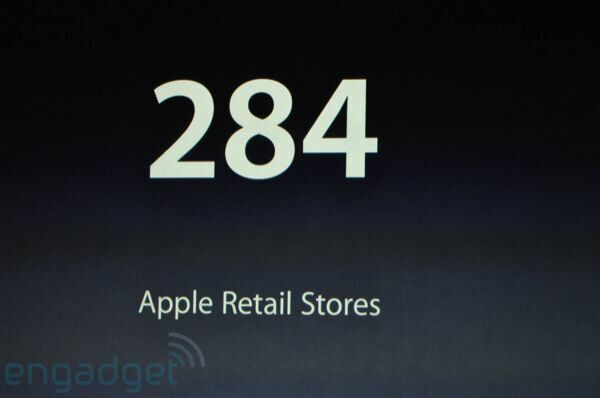 10:23AM – iTunes store. The UI on this thing is pretty intense, so far. 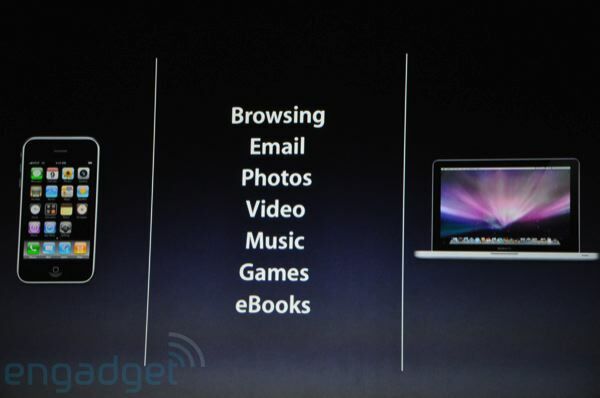 Everything is familiar, but it’s all totally different from iPhone and OS X — this is a big launch for Apple. As if you hadn’t already noticed. 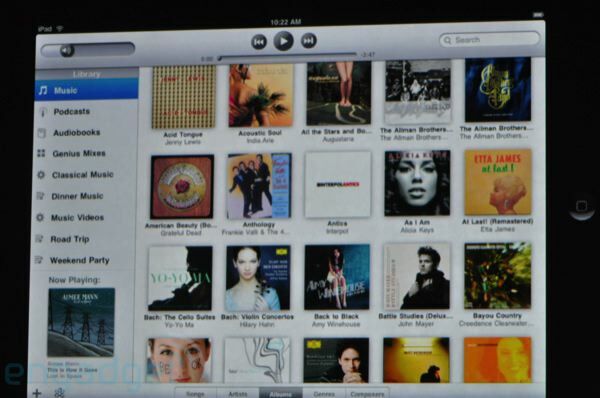 10:22AM – Music, large iTunes LP album artwork. 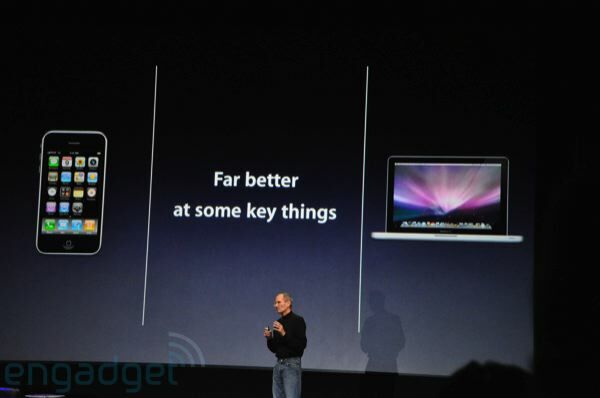 Naturally Steve had to get an “It all works!” in there. 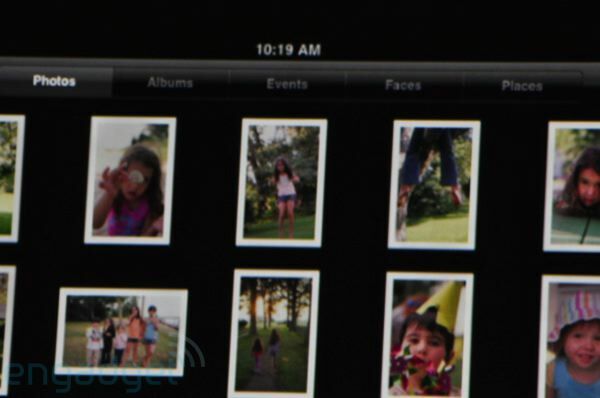 10:20AM – Built-in slideshows. Music playing with the slides and transitions. Looks pretty damned good! 10:19AM – Next, photos! 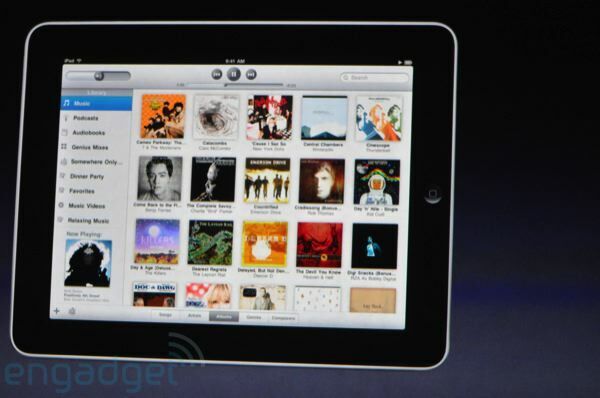 Flick through — albums too. 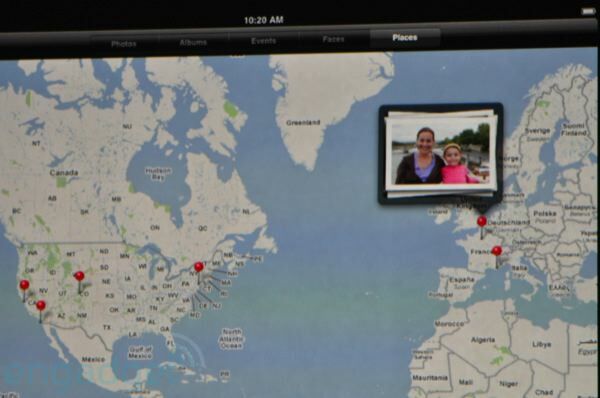 “If I’m on a Mac, I can get events, places, and faces from iPhoto.” Neato. 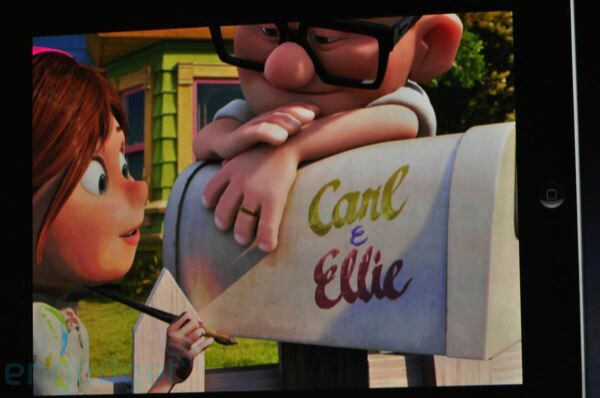 10:18AM – “That’s how simple mail is. 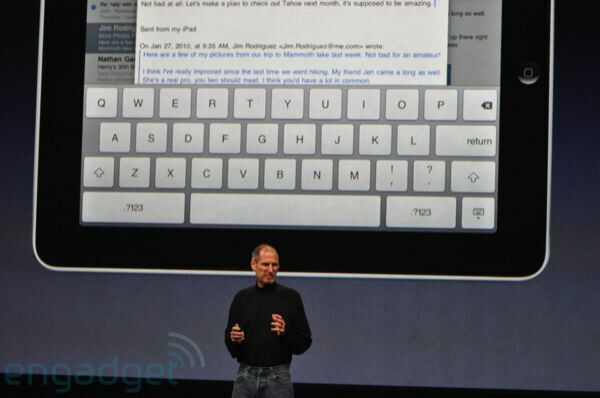 If I want to reply to a message, up pops this gorgeous keyboard.” Steve is typing with two hands on his lap — not using thumbs. Very interesting. 10:17AM – “This is gorgeous. Right in the palm of your hand. 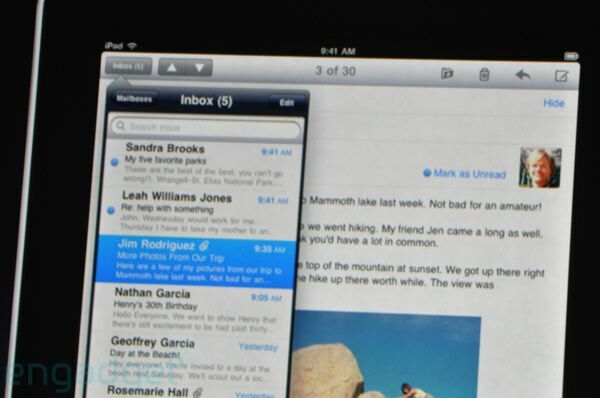 Let’s go to email.” Man, I dunno, there is like too much room! 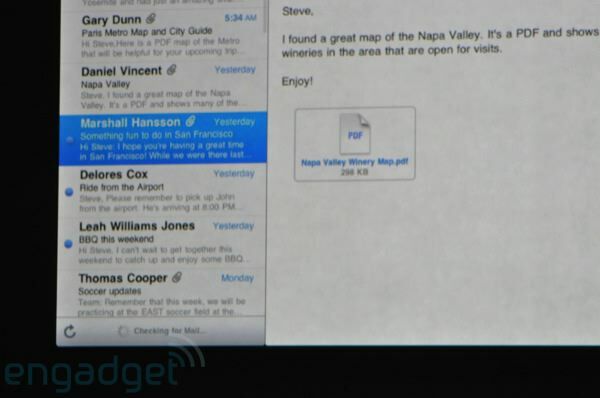 Horizontal email view is pretty sweet though, finally two pane! 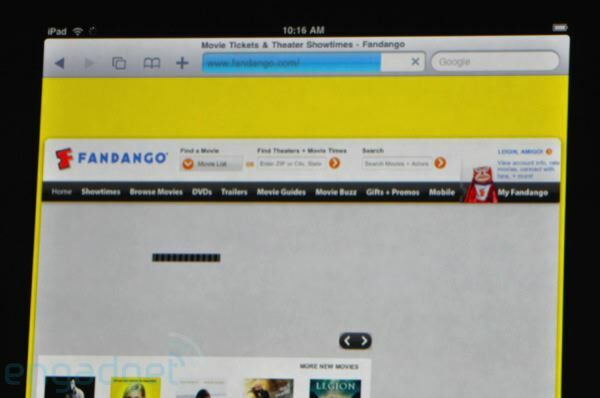 10:16AM – “Going to Fandango — grab the tablet that’s in the kitchen, buy some tickets. It’s that simple.” It sure is, Steve. 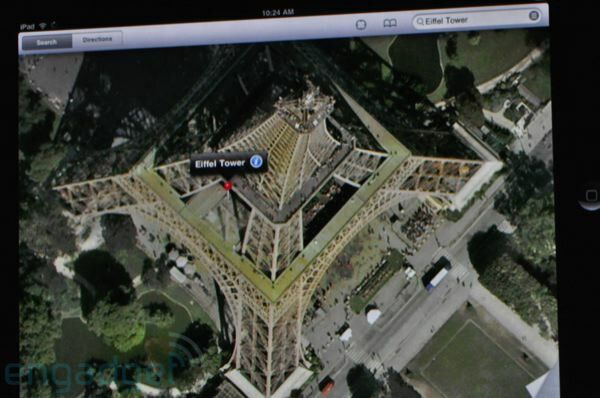 10:15AM – Going to the Time site. 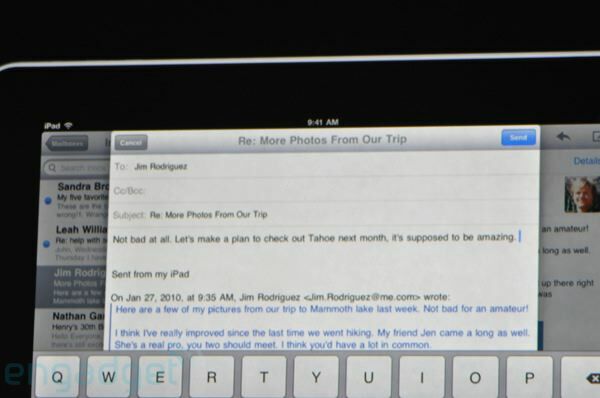 The scrolling is super smooth, it’s pretty damned nice. 10:02AM – “Before we get to that, I’ve got a few updates.” Chuckles. 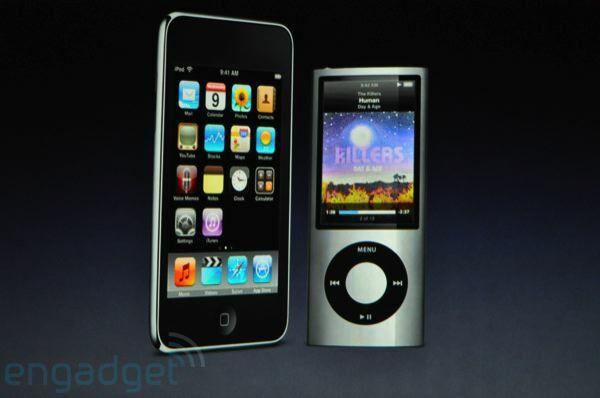 “First: iPods. 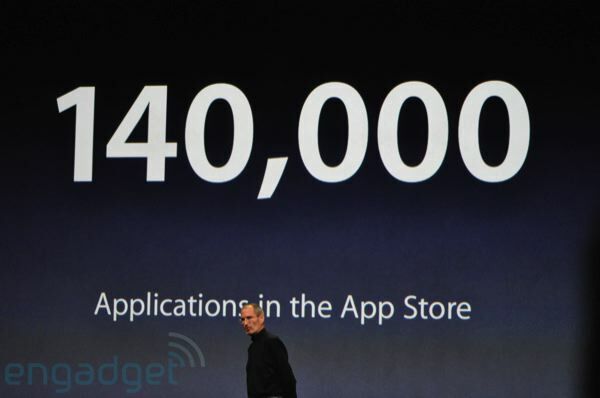 A few weeks ago we sold our 250 millionth iPod.” Big applause. 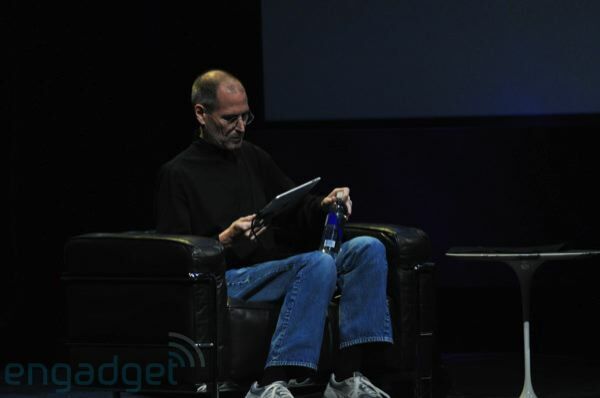 10:01AM – Steve is out! Huge applause. 9:59AM – Yep, all Dylan jams this time. This is definitely a Steve event. 9:57AM – Oh hey, Al gore! 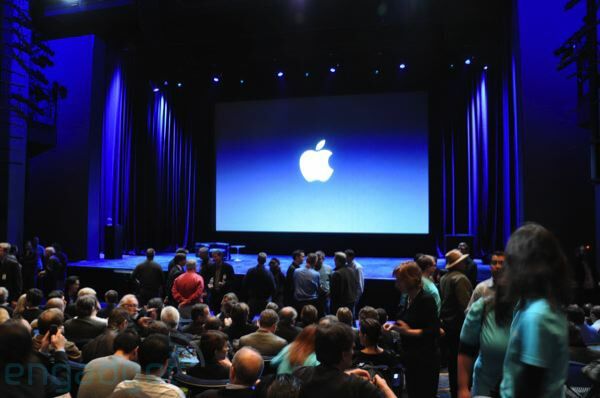 People are getting seated, looks like we’re getting started on time today. 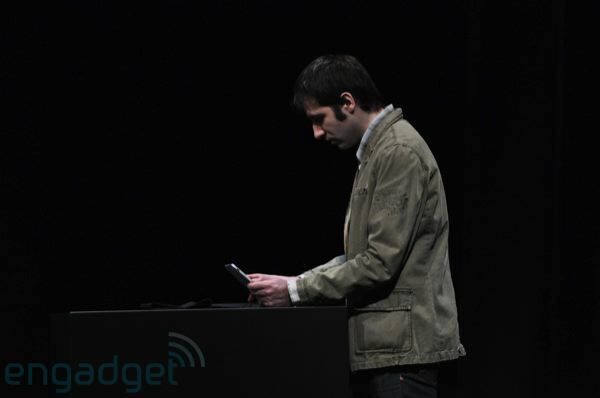 9:55AM – Also, big ups to my boy Chris at Joystiq for lending a hand with our live coverage! 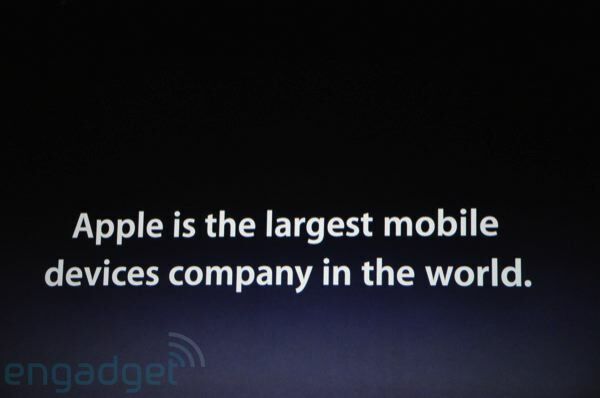 9:54AM – Tim Cook, Phil Schiller, and other senior execs up front talking and laughing. Everyone looks pretty jubilant! 9:49AM – House WiFi is crazy slow right now, hopefully things hold out for the event! 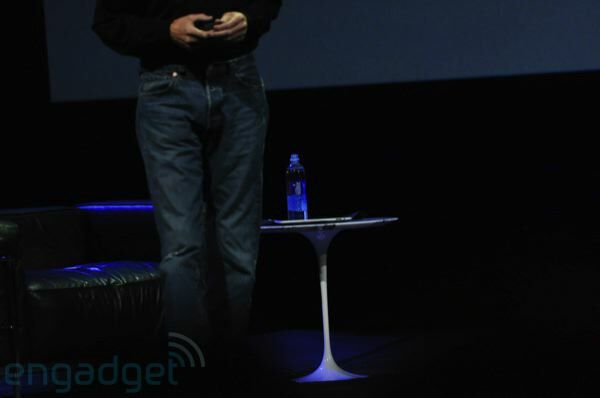 9:44AM – There’s a small Saarinen table on stage, as well as a Le Corbusier seat. 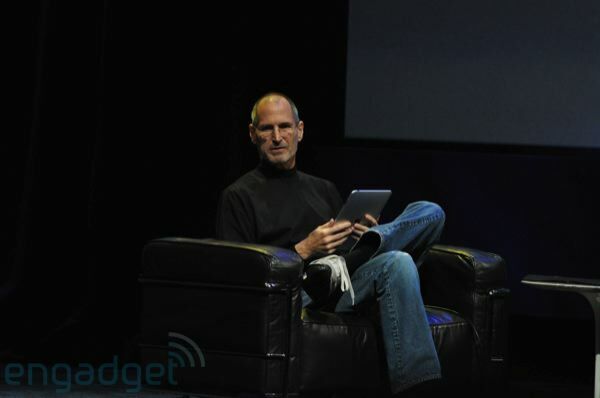 Is Steve going to take a seat and wax poetic about his years in the biz? 9:41AM – Alright, we’re in! Dylan playing on the PA — Steve’s favorite! 9:17AM – Alright, we’re in! Doors aren’t open yet though, so we’re huddled in with all the other reporters and guests. 9:05AM – Yowch, media line this time is fairly crazy! Standing by for admission. 9:01AM – Almost to the event! 12:19AM – While you’re killing time waiting for the keynote to start, make sure you check out some of the contests we’ve got running right now! We’re giving away a Sony DSLR-A330 camera, Sony HDR-CX100 HD camcorder, and Sonos S5 wireless music system — all pretty amazing devices. Go on, we’ll still be here. 12:18AM – I know, the suspense is killing me, too. Check back later this morning for live coverage! 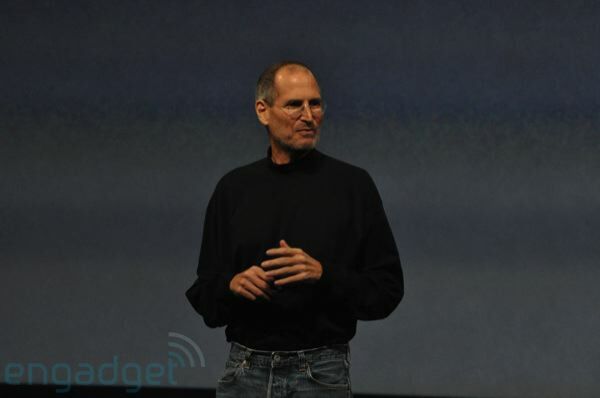 This entry was posted in Apple and tagged iPad on January 28, 2010 by enddl22. 10:46AM This is very slick — probably the most impressive demo yet. A very sophisticated use of the screen real estate. 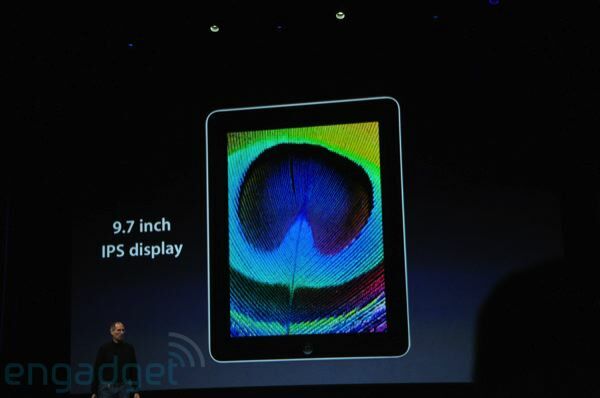 Brushes for the iPad looks like you can go pretty deep. Available at product launch. 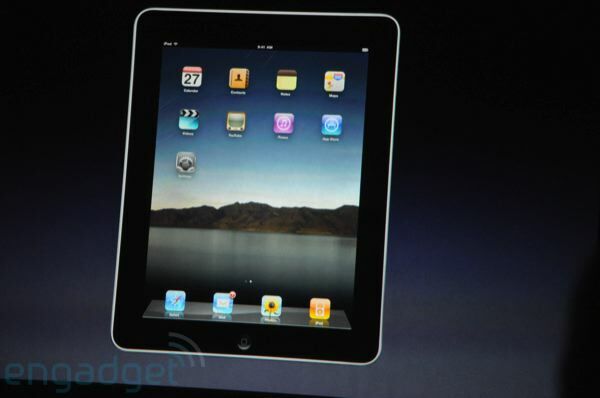 10:45AM “Today I’d like to show you how brushes looks on the iPad.” This is nice. 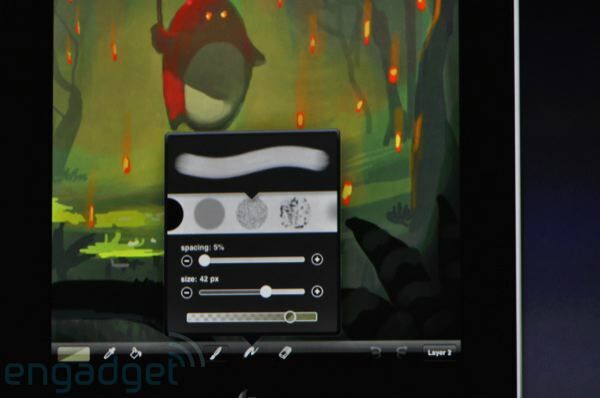 Context menus for brush and color options. We’re loving these new pop-over menus. No more diving! 10:42AM “We think we’ve captured the essence of reading the newspaper. 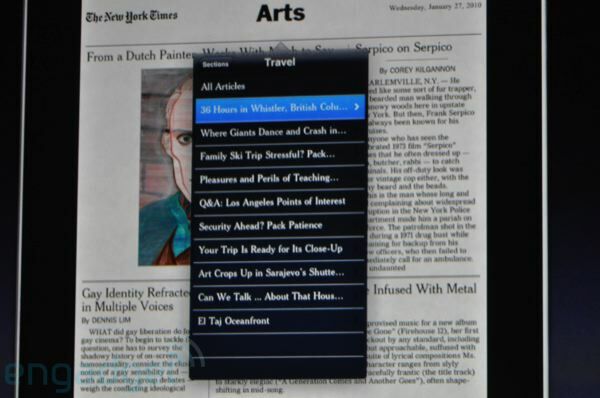 A superior experience in a native application.” Wow, the layout is just like a standard paper, and again we’ve got those dropdown context menus. 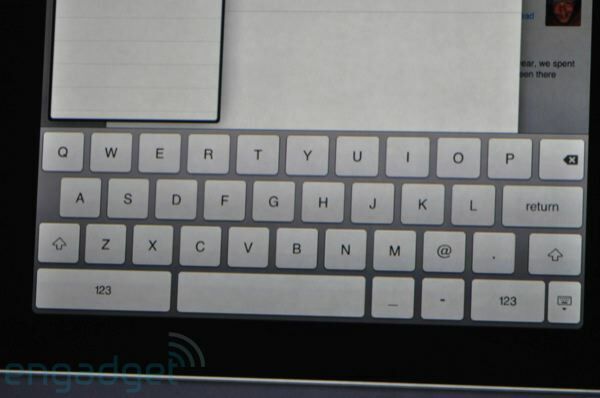 You can resize text with a pinch. 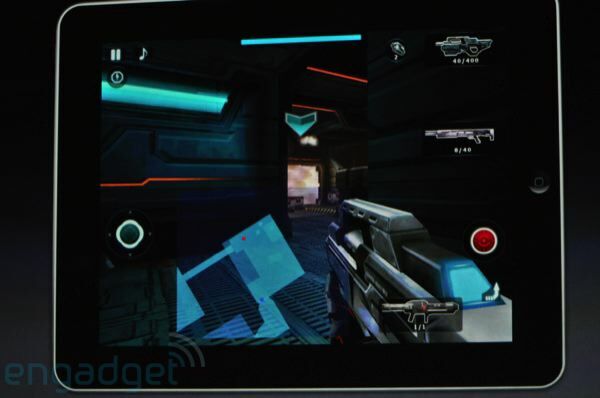 10:39AM Showing off their FPS Nova. 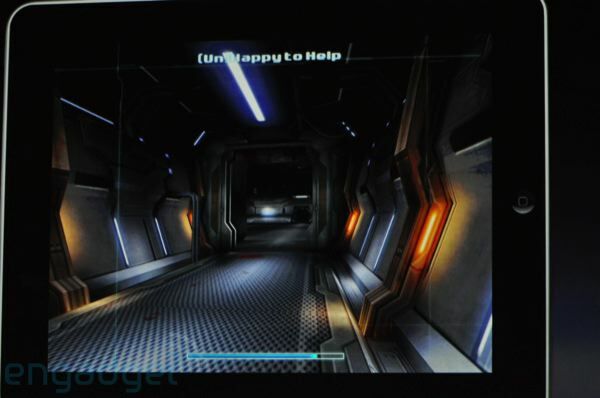 “I can slide the d-pad on the screen…” You can set up your own controls. 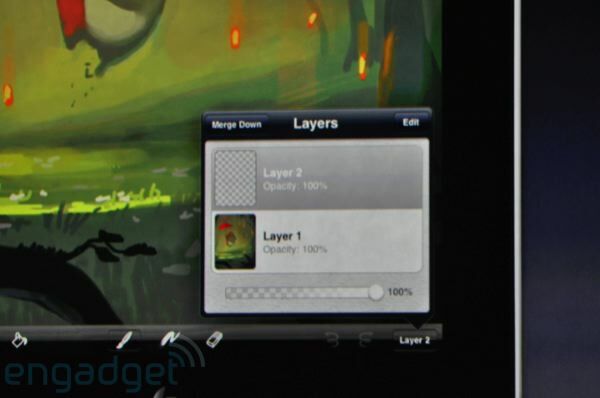 New gestures for interacting with games. 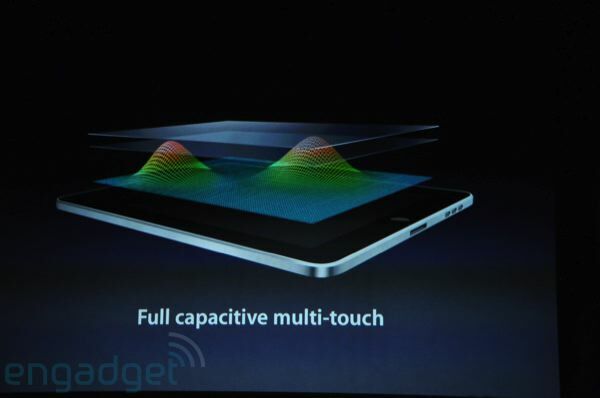 This isn’t anything breathtaking just yet — fairly standard graphics (though nice), nothing new in terms of interaction. 10:37AM “We’re exciting about possibilities on this. So we invited some developers two weeks ago to see what they could create. We want to show you what they came up with. 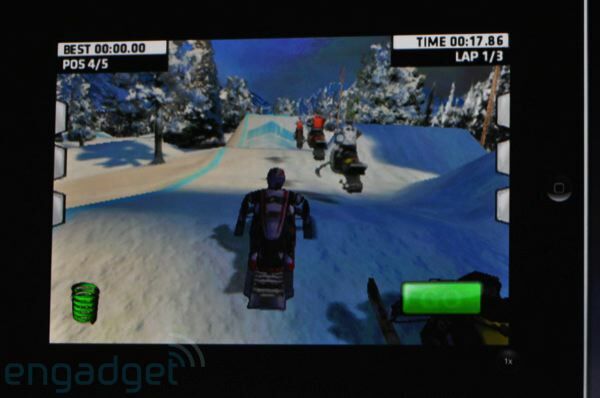 First, Gameloft.” Mark Hickey from Gameloft is up. 10:34AM So far no word on multitasking, but we haven’t seen it. Jumps into and out of apps, nothing running concurrently. 10:33AM “Let’s start with Facebook. 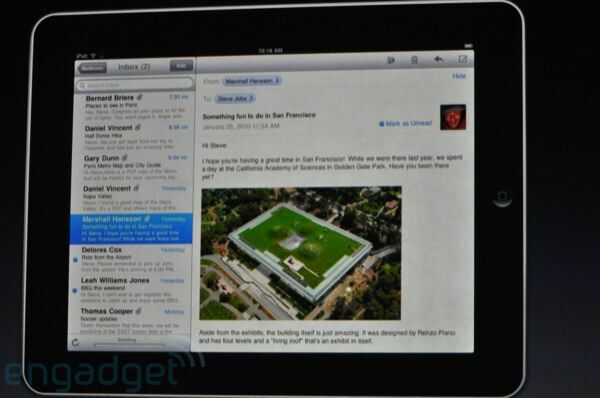 It just works.” He’s showing off the non-pixel doubled version, a small app in the middle of the screen. It’s kind of silly looking. 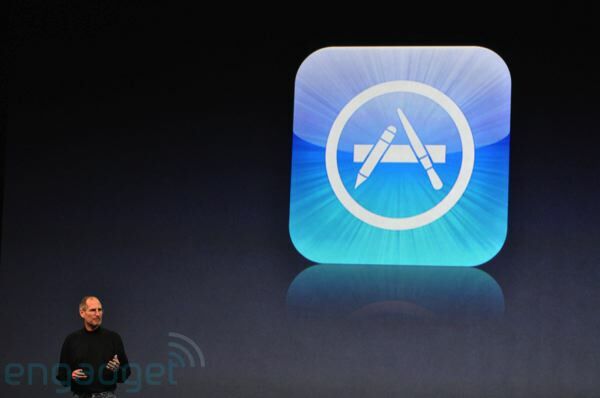 A lone app in the center of a black screen. 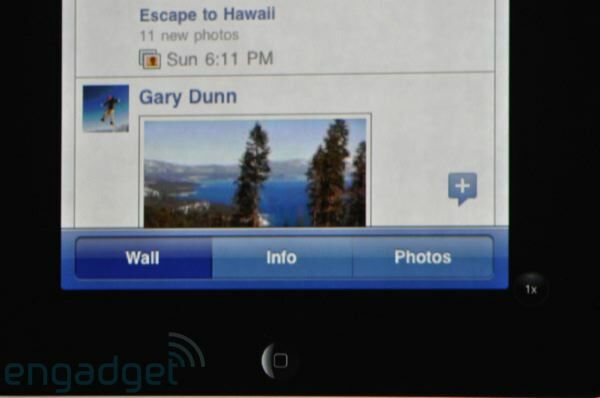 The scaled up app looks silly as well, especially in Facebook. 10:31AM “Now, let’s go back to software. 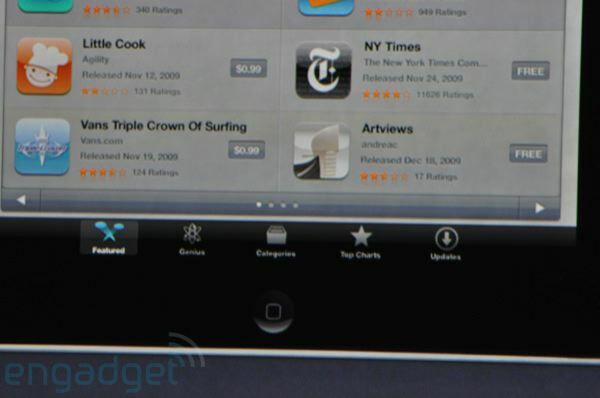 We’ve seen some great built in apps. Let’s talk about third party. 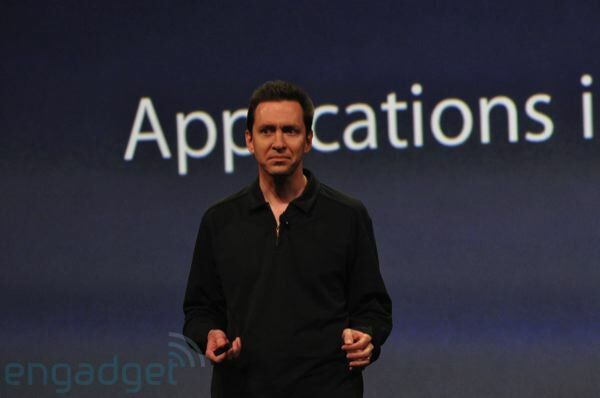 Let’s talk about the app store.” Scott Forstall is out! 10:22AM “Let me show you a few other things. 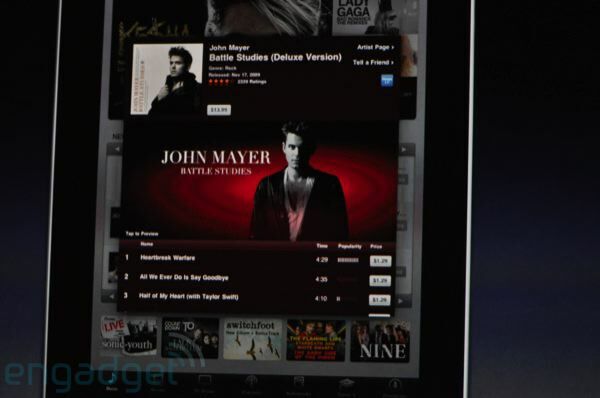 The iTunes store is built right in. 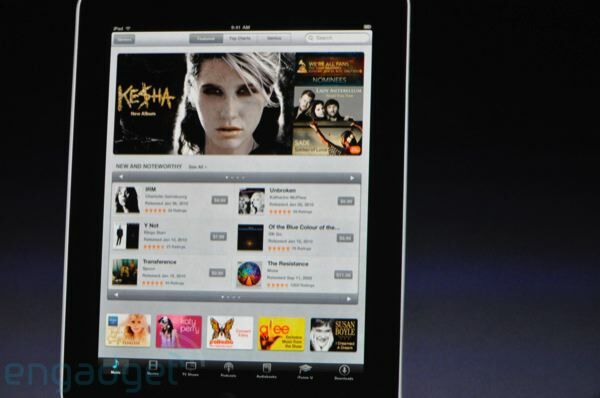 I can sample music, buy songs.” The interface has modals that pop over what you’re viewing to show you song / album info. 10:18AM “Next, photos… this is what photos looks like. 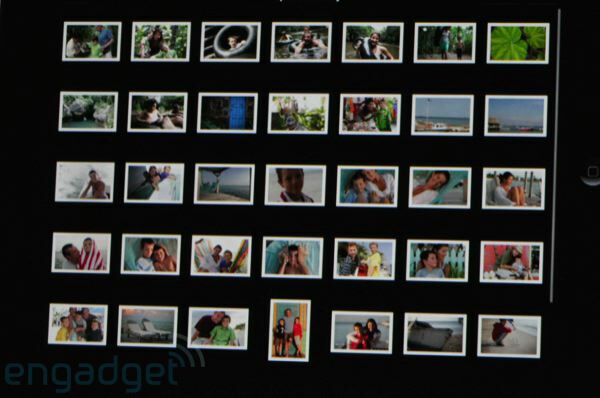 I can look at everything as a list of photos. 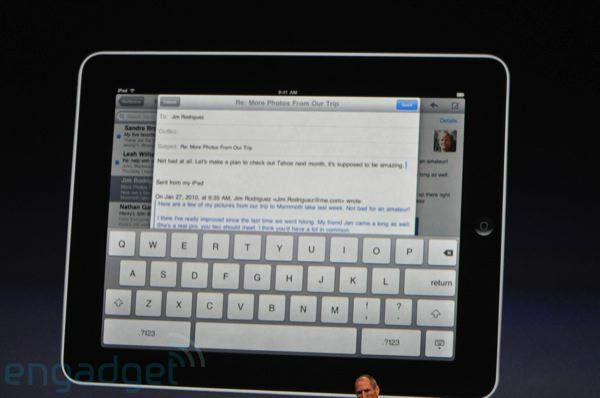 I can tap on it…” Flicks and gestures just like the iPhone. 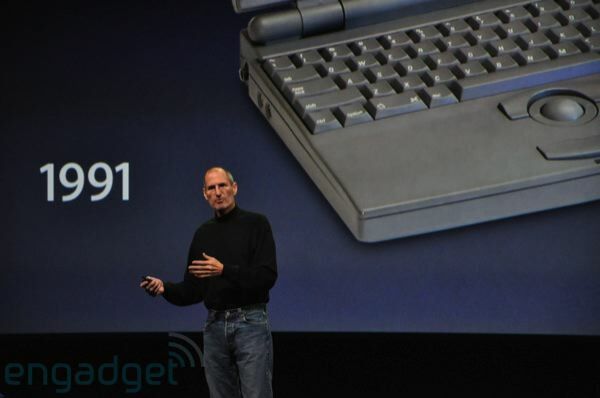 10:18AM “Now if I want to send a message, I hit compose — up pops this gorgeous keyboard.” Steve is typing, it looks very responsive. 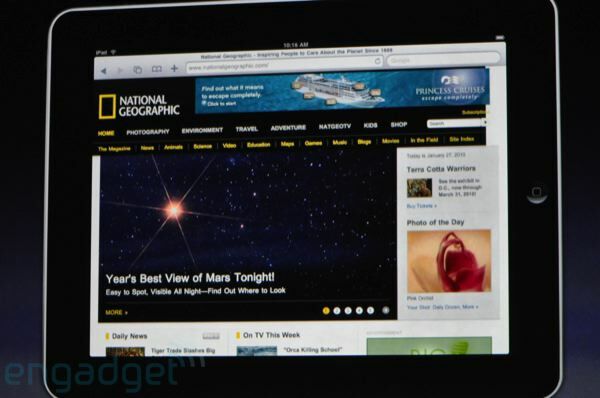 10:16AM Now Steve is on Fandango… Now National Geographic. 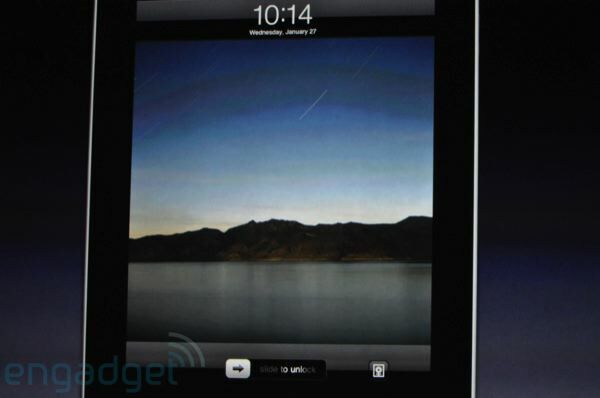 Switching to landscape. If you’re an iPhone owner this will seem very familiar. 10:14AM Slide to unlock screen just like the iPhone. 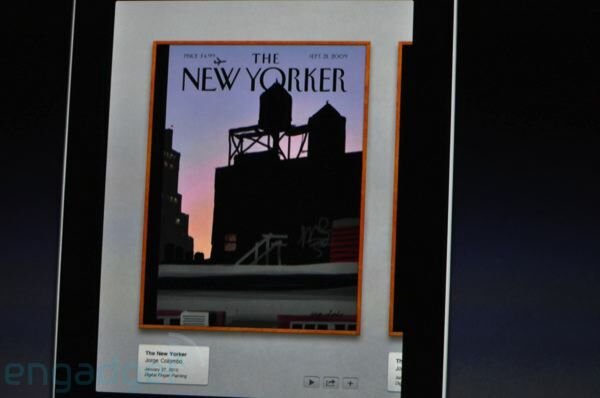 “This is the lock screen — icons fly in. 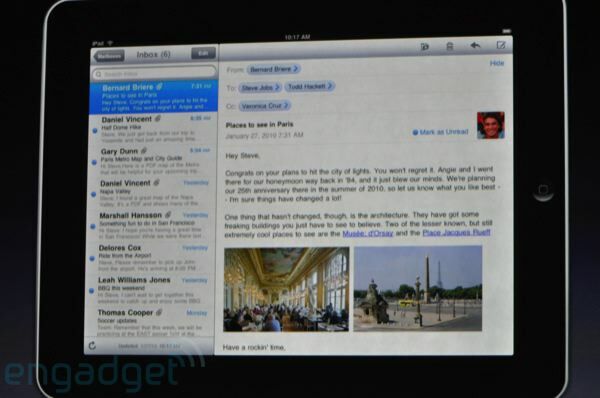 Let’s go right to the web…” Apple.com — Bookmarks drop down from a bunch of contextual menus up top. 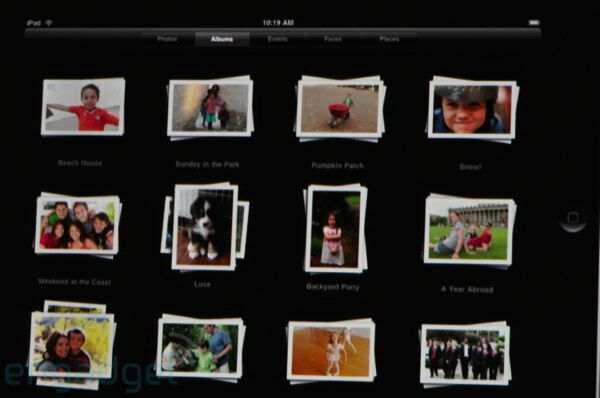 10:12AM “Album, photos… you can look at all of them, flick through them, it’s a wonderful way to share. 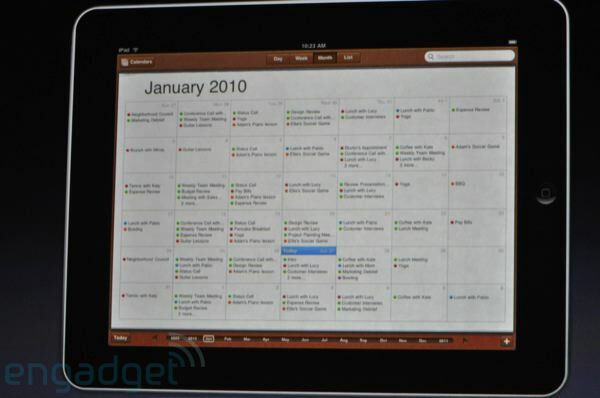 Calendar… months…” The interface really does look like an exploded iPhone. 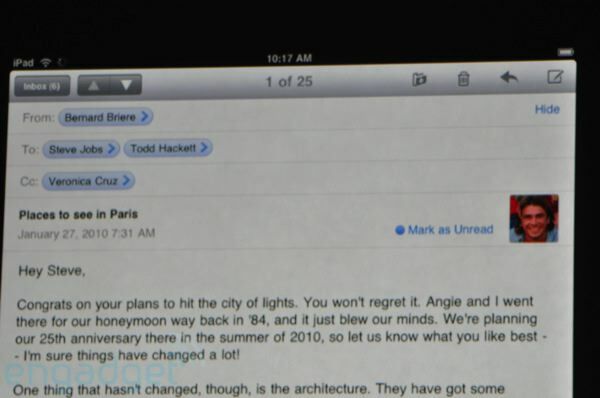 10:12AM “Phenomenal for mail.” Wow, new drop downs in the mail interface… and a large onscreen QWERTY! 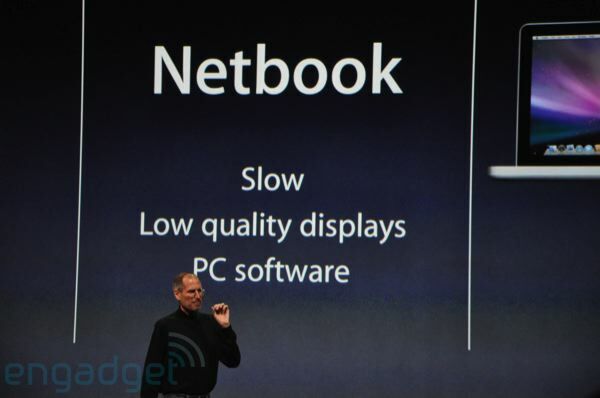 10:09AM “Now some people thought that was a netbook — the problem is that netbooks aren’t better than anything!” Big cheers! Ha! 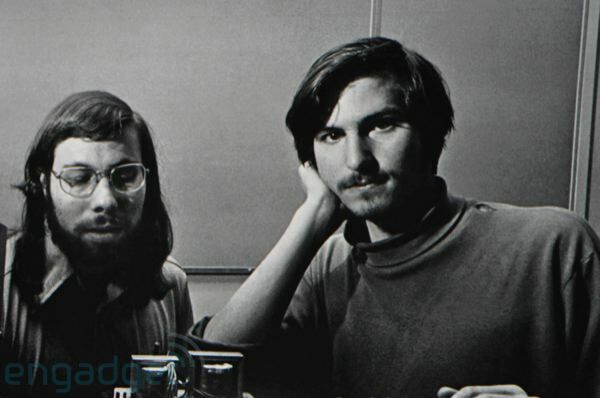 10:05AM “Lastly — we started Apple in 1976 — 34 years later we just ended our holiday quarter with 50.6b dollars of revenue…” He showed a pic of him and Woz! 10:01AM And Steve is out! Huge applause… and a standing ovation from some audience members. 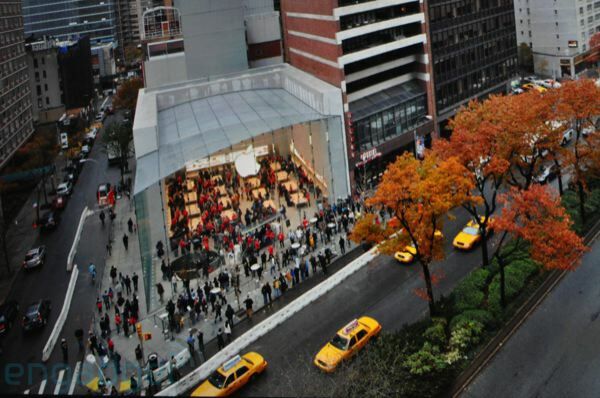 10:00AM The lights are going down… here we go! 10:00AM Verizon and Sprint 3G cards are your good, good buddies at an Apple event. 9:56AM “Please silence your phones… our program will begin shortly.” Oooh. 9:55AM Sitting next Jim Dalrymple from The Loop… who’s currently dealing with the aforementioned WiFi issues. 9:54AM Everyone is really all smiles here. 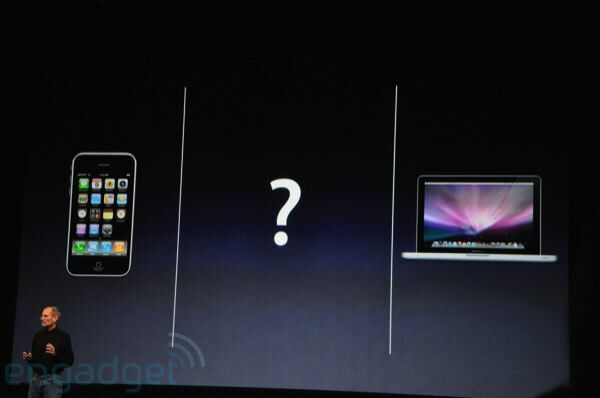 Sure, the WiFi just went out, but generally everyone seems to be quite excited. 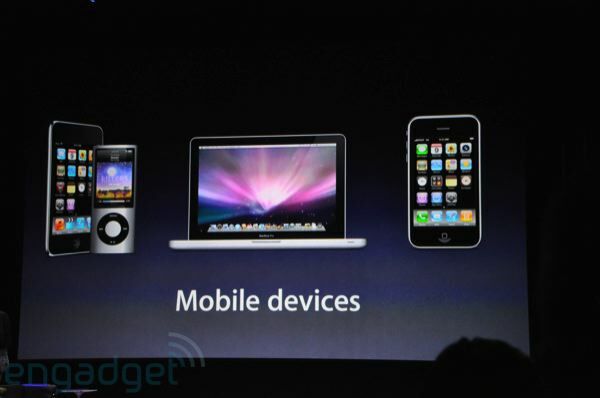 Makes sense, gadgets and money will be flowing like sweet summer wine when this thing is all over. Right? 9:51AM The electric version of ‘Baby Let Me Follow You Down’ — in case you were wondering. 9:50AM So, more Dylan. We swear, if Bob Dylan shows up at this event, we’re going to seriously freak out. In a good way. 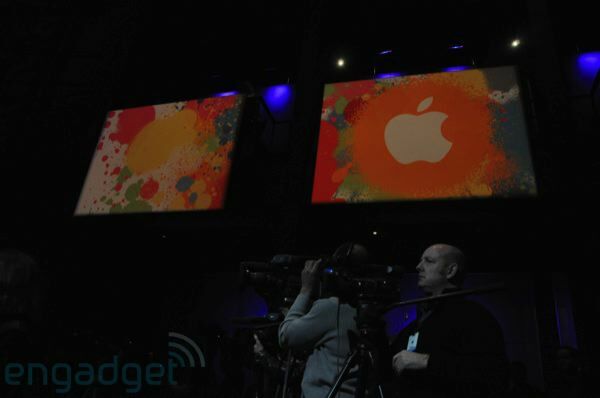 9:43AM The setup on stage is really interesting. 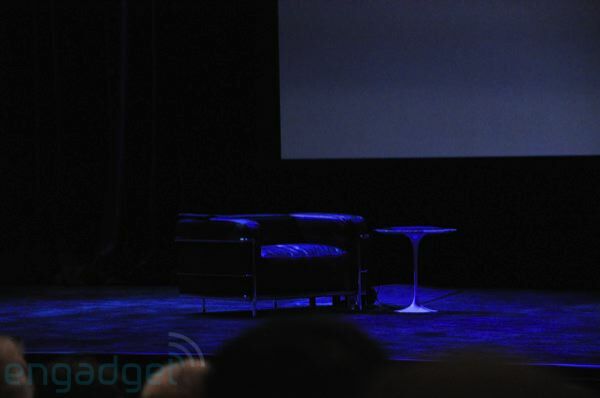 There’s a chair with a table next to it… very unusual for an Apple event. 9:42AM Okay! We’re in our seats and there’s some Dylan playing on the sound system! 9:11AM Overall the mood is really jovial right now. It’s basically a party in the U.S.A.
9:09AM We’re in line waiting to get inside. People are seriously crowding. Let’s hope we don’t get trampled! 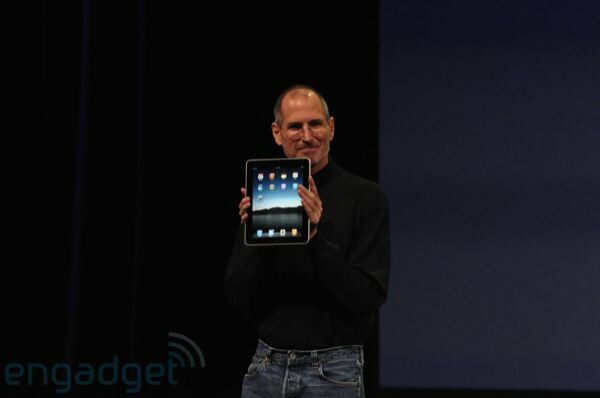 Will the Apple tablet finally, really be unveiled? 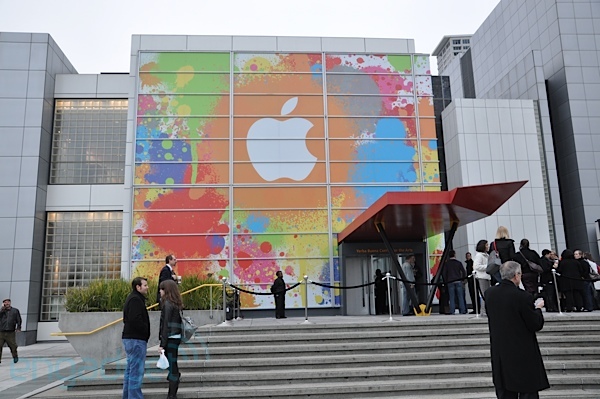 We’re at the Yerba Buena Center in San Francisco (see above) patiently waiting to get inside and get this thing underway! 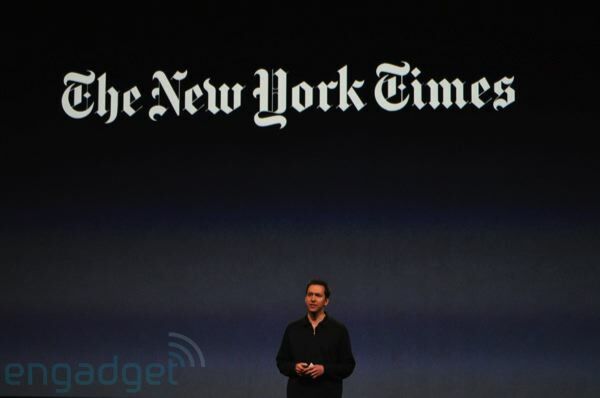 Keep reading after the break for the minute by minute coverage!